Mount Vesuvius, the massive, active volcano that looms over the Bay of Naples and the Campania region, was responsible for the destruction of Roman towns Pompeii and Herculaneum in 79 AD. Vesuvius last erupted in 1944. Allied fliers took photos of the eruption. 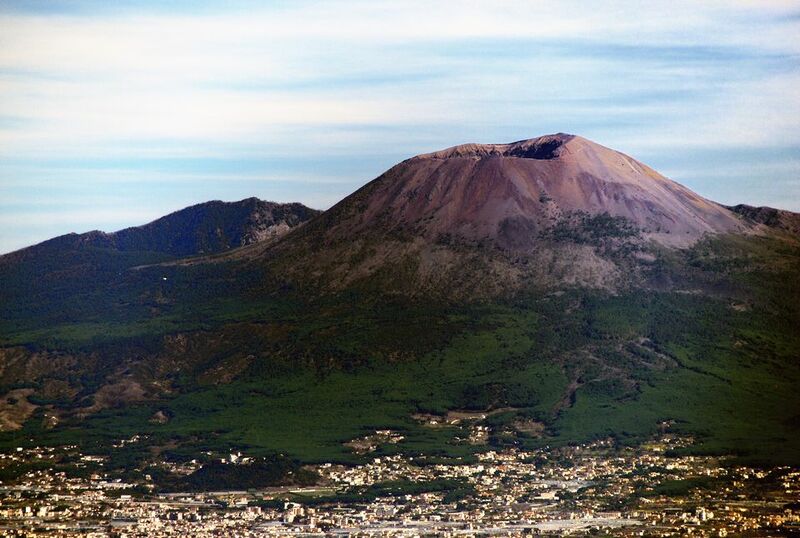 What we call "Vesuvius" is really the younger part of the mountain complex that geologists call "Greater Vesuvius". The older part of the mountain, now an extinct volcano, is called Monte Somma. A fresco recovered from Pompeii shows a single summit and much taller Monte Somma covered in vegetation before the eruption of 79 AD. 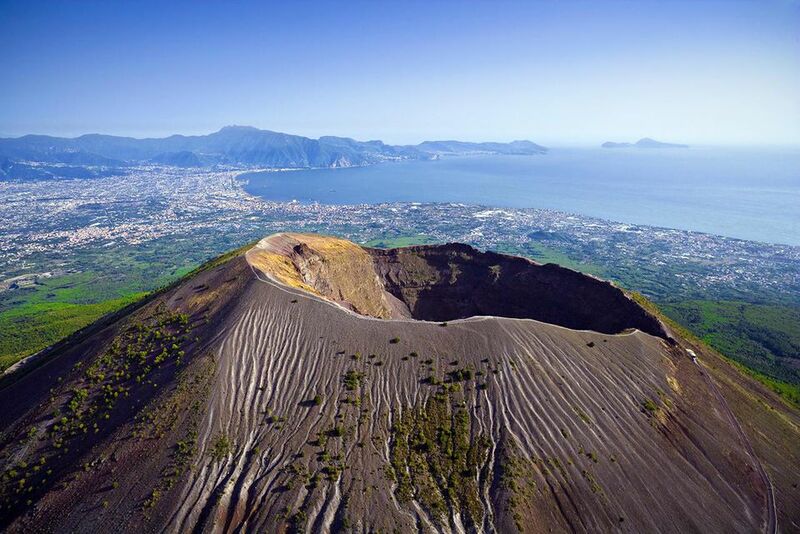 In 1995, the area around Vesuvius was formed into the Parco Nazionale del Vesuvio, the National Park of Vesuvius. It is estimated that 2.5 million people could be affected by a significant eruption of Vesuvius. Conditions are closely monitored. There is a plan in place for the evacuation of people nearest the volcano that assumes between two weeks and 20 days notice of an eruption. Buses can take visitors to within 200 meters of the summit of Vesuvius. There you can buy a ticket to the top, and also purchase refreshments, souvenirs, and even clothing. Remember that it can be considerably cooler at the summit, especially when there are low clouds. Once you have purchased your ticket, you ascend on a wide trail of volcanic stone pocked with larger rocks. Staunch shoes are recommended. The trail switches back several times, then circles the crater. Refreshments are found at the summit and at an intermediate point along the trail. At the summit, you can hire a guide, buy a guidebook, or just peek into the crater on your own. Join us for a virtual visit to the crater of Mt. Vesuvius and the spectacular views through the clouds to the Bay of Naples. There used to be a funicular that whisked you to the summit of Mount Vesuvius, but that has been dismantled. You will have to walk to the summit to see the crater, although there are some good views of Naples and the Bay of Naples from the parking lot. The trail is a wide path of volcanic stones interspersed with some larger rocks that have probably fallen from above. The trails have guard rails provided by fencing, as you can see in the picture. The grade is fairly steep and constant. It will take a moderately conditioned person about 20 minutes to walk to the refreshment stand at the summit where guides can be hired (or will be waiting for tour groups). Passing through clouds or fog is frequent in spring. At the rim of the crater of Mount Vesuvius, you can get something to eat or drink, buy a guidebook, or hire a guide. About halfway up the climb, you can see the lava flow from the 1944 eruption of Vesuvius as well as Naples and the Bay of Naples. This picture of a portion of the Grand Cono, the big cone, shows the active Fumaroles that let out a steady stream of steam around the rim. The crater is 1,282 meters above sea level, 230 meters deep, and has a diameter of about 650 meters. The 650-meter wide crater is difficult to fit into a picture. Here is a picture of the interior of the cone. Vesuvius is often done as a day trip from Naples. Vesuvius is in the Campania region of Italy, known for its great food, in part because of the fertile soil of the slopes of Vesuvius. The towns destroyed in the 79 AD earthquake make interesting trips as well. The ash and lava that covered Pompeii and Herculaneum preserved them to an extent not usually seen in Italian archaeological sites. The Amalfi Coast is a World Heritage Site and one of the most popular destinations in Italy.